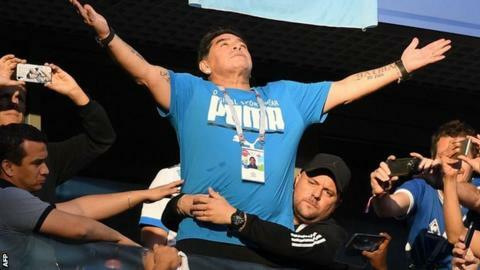 Argentina legend Diego Maradona has been released from hospital after being admitted with internal bleeding in his stomach, his daughter said. The 58-year-old was having a routine medical in his home country when doctors discovered the problem. However, his family said the diagnosis was not serious. "For those who were really worried about my dad I can tell you that he is well," his daughter Dalma said. "He is going home soon." Reuters news agency later reported Maradona had left the hospital. Maradona, who captained Argentina to World Cup victory in 1986, is coach of Mexican second division side Dorados de Sinaloa. He was taken ill during Argentina's victory over Nigeria at last year's World Cup in Russia but later said he was "fine".